It seems like there’s a new cryptocurrency exchange popping up every day. And at this point, I’ve signed up for my fair share of them. But Gemini holds a special place in my heart simply because it’s one of the easiest to use fiat-to-crypto exchanges out there. To be honest, one of the biggest motivating factors for signing up for Gemini in the first place was based on a little personal belief I hold. In case you weren’t aware yet, Gemini was founded by the Winklevoss twins – you know, of Facebook idea-stealing fame. And I can’t help but think that if you feel you were cheated out of the $71.5 billion net worth that could’ve been yours – and publicly, at that – you’d work really, really hard to shed that association and prove yourself. People who have things to prove work harder. And hopefully, create better, more innovative, more secure platforms. So was that belief of mine justified in the case of Gemini? Here’s a full review of my experience and everything else you need to know about Gemini! Let’s start this off by answering the most frequently asked questions about Gemini. Quick stats? Gemini is based in the U.S. (NY, specifically) and launched fairly recently, in 2015. Range of coins? As of now, you can only buy and sell Bitcoin and Ether. You can trade in three pairs: BTC/USD, ETH/USD and ETH/BTC. How to buy coins? You can buy with fiat currency – USD – but no credit or debit cards and no PayPal either. You can also deposit and buy with BTC or ETH. Deposit and withdrawal limits? Unlimited if you’re using wire transfer and/or cryptocurrency. There is a limit if you deposit and withdraw using bank transfer via ACH. FDIC insured? Yes, U.S. dollars in your Gemini account are eligible for FDIC insurance. AML/KYC? Yes, Gemini abides by both Anti-Money Laundering and Know Your Customer regulations since it’s a fully licensed financial institution. 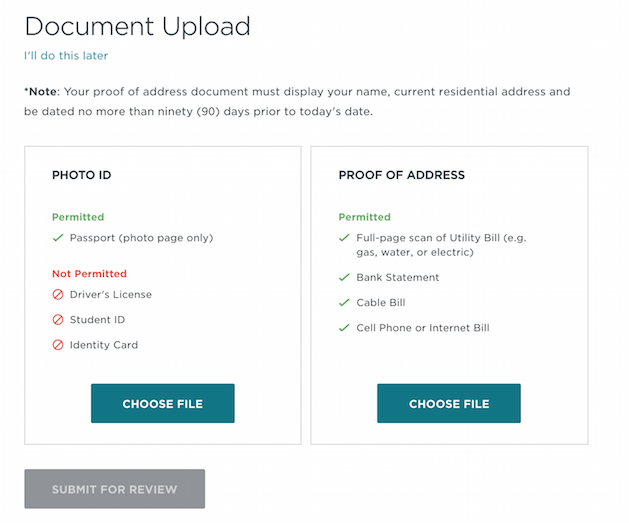 You’ll be required to submit documents to verify your identity. Let’s get this one out of the way since the first thing you’ll want to know is if this exchange services your area. As of now, mid-October 2017 – Gemini operates in a total of 45 U.S. states, Washington D.C., Puerto Rico, Canada, Hong Kong, Singapore, South Korea and the U.K.
As you can see, Gemini’s a good pick for traders and investors in the USA and Asia but not so much if you’re based on Europe. How Long is the Signup Process? With Gemini, the time it takes from signup to being able to purchase BTC or ETH varies. The shortest amount of time you can expect it to take is around a day, if your identity verification goes quickly and you deposit using BTC or ETH. Even if you’re depositing in USD, if you opt for a wire transfer rather than a domestic ACH deposit, you may be able to complete the entire process and start buying and trading within 2 to 3 days. How to Buy Bitcoin on Gemini? Buying Bitcoin or Ether on Gemini is easy – it’s just 4 steps in total until you can get to buying cryptocurrencies. Here’s how long each step takes and exactly what you can expect! Security tip: Gemini doesn’t force you to have a particularly difficult password but that doesn’t mean you should go for easy pickins like ‘password1.’ You main password is the first step to securing your account so use a password generator and add in capitals, lower case, numbers and symbols for maximum difficulty. 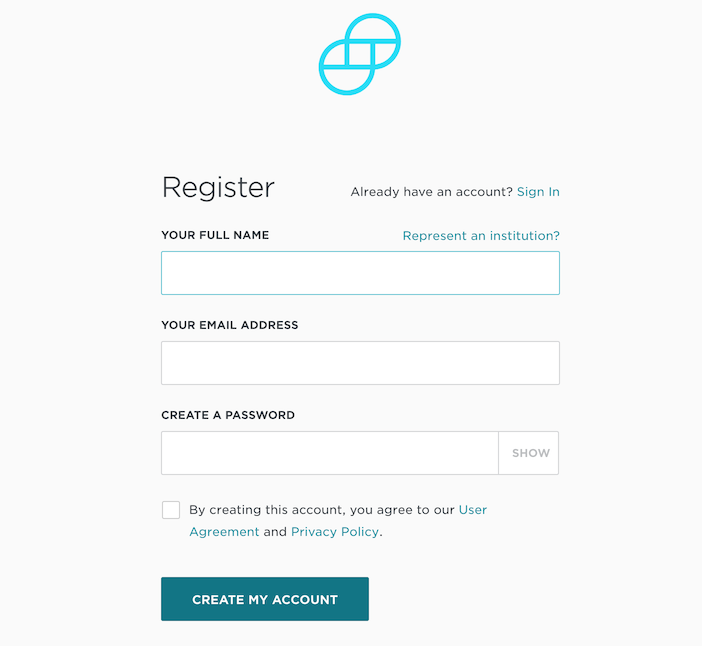 Once you register, you’ll receive an email with an activation code. The whole registration takes about a minute. The first thing you’re required to do to begin using Gemini is to set up 2FA (two-factor authentication) with your mobile device. This is required for all Gemini users – which is great since it adds a mandatory level of security. The fact that Gemini makes it mandatory for all users to set up 2FA before adding any personal and financial details gives Gemini automatic points for security. Seriously, each and every coin exchange should make this a mandatory level of security. Even better, Gemini recommends Authy for this, which is an authentification app like Google Authenticator but more convenient and secure because it syncs across your other devices (not just your phone), and more importantly – allows you to PIN-protect the app itself. You can continue using your phone number, of course, but Authy is quick to set up and worth the few minutes it’ll take. The next step is to verify your identity, which consists of entering in personal details like your name, passport number and your home address. You’ll also need to send documents for the verification. I’ve heard it can take as little as a day for Gemini to verify documents but for me, it took Gemini a full 3 days to verify my account, which is still on the faster side compared to some other exchanges. Perhaps mine took longer because I submitted a bank document with my full name, address and date but was entirely in a non-English language. If you do this, by the way, send customer service an email explaining that you were only able to get the document in the language of the country you’re from and that it includes all the details they asked for. USD Bank Transfer (Instant ACH Deposits): This option is only available for residents of the U.S. and these deposits via ACH typically take 4 – 5 business days to clear. To speed things up, initiate the transfer before 5:00 p.m. ET Monday – Friday as that’s when they’re processed. Also keep in mind that unlike wire transfers (below), ACH deposits have daily and monthly limits. USD Wire Transfer: This is available for those in the U.S. as well as for everyone outside the U.S. and although your bank may charge for wire transfers, they are more convenient since wires are irreversible so the funds are immediately available once they’re received into Gemini’s bank account. That means funds sent by domestic wire transfer before 3:00 p.m. ET should be available in your account the same day or next business day. Gemini also has no limit on wire transfers so you could, in theory, transfer as much USD as you’re comfortable with. Bitcoin: Bitcoin deposits naturally clear much faster so any Bitcoin you deposit into your Gemini account will become available for trading after 3 confirmations of the Bitcoin network, which happens in around 30 minutes. Ethereum: Ether deposits are even better – these will be available in your account after 12 confirmations of the Ethereum network, which takes just around 3 minutes. The bad news? 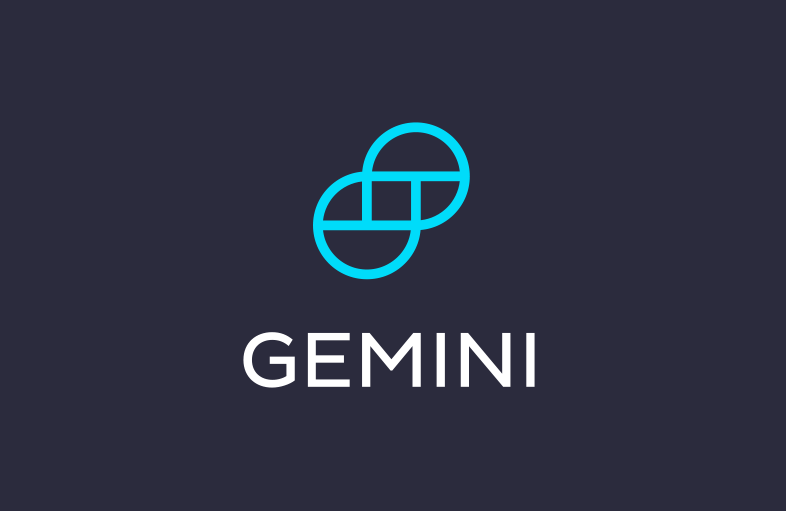 No debit card, credit card, cash, check or PayPal options are currently offered on Gemini. The good news? Gemini doesn’t charge fees for deposits although your bank may still charge you for wire transfers. Gemini also offers free withdrawals, although these are capped at 30 free withdrawals per calendar month for BTC and ETH. Either way, once your deposit clears – you’re ready to buy! Quick note: For foreign investors with US bank accounts, Gemini doesn’t offer the option to link your US bank account. You’ll only be able to use a bank account that’s in the country of residence. As you know by now, Gemini Exchange doesn’t charge fees for deposits (although your bank may still charge you for wire transfers). Gemini also offers free withdrawals, although these are capped at 30 free withdrawals per calendar month for BTC and ETH. They do charge trading fees, however – and since Gemini’s fee setup is unique from other exchanges, and the first time you take a look through Gemini’s Trading Fees & Rebates – you may be confused. So let’s break it down. Base Fees. The maximum fees you’ll be paying for buying or selling is the base fee of 25 bps (basis points), which translates to 0.25% of your investment (the money you put to trade). So if you place $1,000 on trade and you buy, you’ll be paying a 0.25% fee off that trade, bringing the total to $1,002.50. The extra $2.50 is your fee. More is Less. The beauty of Gemini’s fee structure is that the more you buy, the less fees you pay. Whereas 25 bps is the base fee, you get discounts and rebates based on your trading volume as well as your buy/sell ratio. This makes Gemini’s fees competitive for investors looking to buy and hold and particularly for active traders. Gemini’s deposit and withdrawal limits are generous – but they do vary. This is without a doubt one of the most important considerations you’ll have when choosing a cryptocurrency exchange. So how does Gemini’s security measure up? For starters, Gemini Trust Company, LLC is a New York-based cryptocurrency exchange that’s regulated by the New York State Department of Financial Services (NYSDFS), which imposes capitalization, compliance, consumer protection, anti-money laundering, and cyber security requirements. It also has the distinction of being the first digital asset business to be regulated and secured to the same standards as banks and other financial institutions. Currently, it’s one of the three largest regulated exchanges in the U.S. But that doesn’t paint the whole picture when it comes to the security of your precious coins. So let’s take a more detailed look at the good and bad of Gemini’s safety. FDIC insured. The U.S. dollars in your Gemini account are eligible for FDIC insurance, which covers up to $250,000. Gemini itself can’t provide FDIC insurance for its accounts since its an LLTC but all US dollars transferred to Gemini is held at a New York-based bank and it eligible for FDIC insurance. Mandatory 2FA. Gemini makes it mandatory to have 2FA set up on your account and strongly recommends Authy, providing an extra layer of basic security. Gemini requires 2FA when you sign in as well as any time when you’re about to take ‘critical actions’ like withdrawing Bitcoins or transferring funds. Offline, cold storage. Gemini’s security is pretty top-notch and you’ve got two options when it comes to security. One is their Depository Account which is free of charge for all customers – this stores the majority of digital assets – i.e. Bitcoin and Ether – in cold storage. Another, even safer option is a Custody Account which has an annual fee but protects digital assets in cold storage using unique Bitcoin addresses. You can read more about the options here and here. No large-scale hacks. One thing to note is that Gemini hasn’t suffered any large-scale hacks yet. While this doesn’t necessarily guarantee anything for the future, it’s still a good sign. Credible founders. The Winklevoss twins have been busy with a lot more than Facebook – to date, they’ve invested in a range of successful startups and have strong relationships with regulators as well as active interest in developing the space since they’re working on getting a Bitcoin ETF approved. Digital assets aren’t FDIC insured. The digital assets you store on Gemini (i.e. Bitcoin and Ether) aren’t covered by FDIC insurance since the U.S. government does not insure any digital asset deposits. That being said, Gemini’s security for digital assets is top-notch (see above). To be fair, it’s not just Gemini – digital assets on any cryptocurrency exchange are neither insured nor completely safe, which is why we always recommend that you transfer and hold most of your cryptocurrency in a secure, private wallet. For anything that involves money – and often, a significant amount of money – you want to make sure that you can reach customer service swiftly in the event of emergency. If not a regular, 24/7 customer service that you can speak to immediately – at least a fraud hotline. Or at the very least, someone you can talk to between normal business hours. In the case of Gemini, customer support is about average. FAQ Section. The FAQ section is pretty lacking. They’re essentially just links to other pages on their site that you would’ve already searched through for answers to your question. 24/7 Support Center (Email Only). A help center that’s supposed to be open 24/7 but only by submitting a request form through email. Response times have been anywhere from a few hours to 24 hours. Not near fast enough, especially if you’re dealing with an urgent matter. Gemini Customer Service Number. You can reach Gemini via toll-free phone at +1 (866) 240-5113. However – all you’ll get is an automated message asking you to check out their FAQ section or send them an email to their support center. So this option is pretty much useless. To be fair, Gemini’s communication pales in comparison to most major banks but is pretty good when compared to other cryptocurrency exchanges. For example, if you’re switching over from CoinBase, you’ll find Gemini’s customer support astoundingly good. But on the other hand, if you’re switching over from a cryptocurrency exchange in say, South Korea, where the main exchanges offer 24/7 phone support – you’re likely to be sorely disappointed. In cases where it’s not an emergency, though – Gemini has proved decent enough. Every time I’ve emailed Gemini with a question or comment, they’ve gotten back to me within 24 hours. Not great, but not bad. Is Gemini Exchange Worth Signing Up For? If you’re based in the U.S. or any of the countries that Gemini supports – then yes, Gemini is definitely one of the top options for 3 simple reasons: it’s one of the few that offers a quick fiat-to-crypto exchange, it has extremely low fees and it’s a secure platform for both your fiat currency and your cryptocurrency. Plus, it’s free and it takes only a few minutes (on your part) to register. So sign up already!